Removing snow and ice from around your home is an essential winter safety activity. However, according to the American Academy of Orthopaedic Surgeons, about 16,500 people visit the emergency room each year to treat injuries they received while shoveling snow. These injuries range in severity from blisters to heart attacks, but most are preventable with proper safety procedures. Keeping your driveway and walkway clear of snow and ice will help prevent falls this winter, but it's essential that you keep some safety tips in mind as your shovel. Certain people should avoid shoveling snow, since they may be more prone to injury. If you have a history of heart problems, you should avoid this activity. Although it may be tempting to just run out and shovel the front walk in what you're wearing, you can prevent injury by dressing for this activity. Always dress in layers, so you can remove clothing if you become too hot. Wear warm socks, a head covering, a scarf, and mittens or gloves. Wear waterproof boots with soles that are slip-resistant. Before you begin shoveling the snow, warm up your muscles for approximately ten minutes by doing stretches or other light exercises. According to Harvard Health Publications, warming up first can prevent injuries and heart attacks. When using a snow shovel make sure the shovel fits your body size and your level of strength. Make sure your shovel has a handle that is the right length for your height. 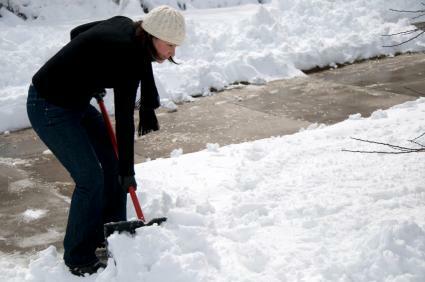 Using one that is too short means that you will be leaning forward more as you shovel the snow, and you are running the risk of a back injury by doing so. Choose a snow shovel that is comfortable to use and is not too long or too heavy. How you hold your body as you shovel is very important for avoiding back strain. The proper way to lift a shovel full of snow is to keep your back straight while bending your knees and squatting down with your legs apart. Do not throw the shovelfuls of snow over your shoulder or to the side. Instead, carry them to where you want to place the snow. Keep your arms close to your body instead of outstretched when carrying shovelfuls of snow. Doing this reduces stress placed on your back and spine. Start removing the snow when the ground is lightly covered and keep clearing it often. Doing this greatly reduces the accumulation of heavy, packed snow. Rather than lifting the snow, push it as much as possible. If you must lift the snow, do not overload the shovel. If the snow is deep, remove it in layers. Take a bottle of water with you when you go out to shovel. Drink regularly so that you don't become dehydrated as you work. Be very careful not to overexert yourself as you work. Pace yourself and take breaks often. It's a good idea to go indoors to warm up from time to time. Taking five to ten minutes to relax gives your body time to rest. Pay attention to the signals your body is sending. If you feel pain or pressure in your chest, call your doctor right away. Watch for slippery areas, patches of ice, and areas that are uneven. Once the driveway has been cleared, consider sprinkling some rock salt on it. This will be helpful if the local forecast calls for freezing rain. The rock salt will help to melt ice and lower the risk of slipping. As you work, be sure you have a non-slippery spot to stand. Put down kitty litter or some other traction material before you walk on the ice. Putting a layer of rock salt (sodium chloride) on icy areas is an effective way to melt the ice. However, rock salt can cause damage to concrete and metal surfaces and is also harmful to plants. Magnesium chloride is less corrosive that other chemical products and works well for melting ice. Before using any ice melting products read the labels carefully. Remove any hanging icicles from roof edges and gutters. This will help prevent injuries to children and pets when they fall. If a lot of snow has accumulated on the roof of your home, you may need to remove it to avoid leaks. Additionally, snow is heavy and can strain the structure of your house. Keep these tips in mind. The safest way to remove snow from the roof of your property is to do so from ground level using a rake. Don't stand directly below the area you are focusing on when removing snow from the roof of your home. You may be pulling the snow down on top of yourself, and even a small area has the potential to shake loose 100 pounds or more at once. If you need to go up onto the roof to deal with the snow, don't do so alone. Get someone else to act as a spotter, and use a harness or a rope for extra security. Wearing boots with good traction or adding boot chains to your footwear is required if you are going to be doing this type of work. Don't pile the snow up before moving it off the roof. The weight of accumulated snow sitting in one area can damage the affected area and can even lead to a collapse. Snow blowers can be very effective at clearing snow and can save your back; however, they bring their own hazards. Keep these snow blower safety tips in mind if you choose this snow removal method. In addition to following snow removal safety tips, it is always best to check with your doctor to make sure that it is all right for you to shovel snow. If you have a medical condition or are not used to strenuous exercise, you should not remove the snow yourself. It is much safer to have someone else remove it for you. If you are shoveling snow or using a snow blower and experience chest pain, stop immediately and seek medical help.